Hi everyone! Its been a while since I've blogged and I'm happy to report I finished 2 of my projects that I had going on in my Ravelry Notebook! Woot! I love when I can cross a project off my list. It gives me a great since of pride and accomplishment knowing I actually kept at it and completed something! In case I haven't revealed this little tidbit of info about myself, I have a hard time concentrating on my projects. I get bored reaaaally quick with something. That's why I tend to stick to small instant gratification things. I'm actually like this in every hobby I have. I don't know what it is about my concentration, but its pretty much non-existant. Anywho, enough about my lack of mind. Now, on to the F.O's!!! 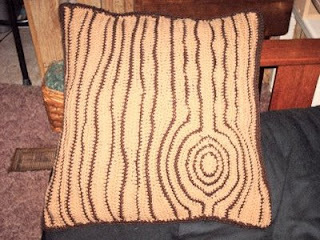 I started this Pillow called the Knotty Pillow from the Jan/Feb issue of Crochet Today! This was such a super easy pattern. If your looking for a cool Crochet project for the man in your life, this pillow is sure to be a hit! My sweetie LOVES it! Don't get me wrong, he supports me in my Crochet adventures, but there's rarely anything that I make that gets a 'WOW!' from him. He's a man after all. If it's not a car and its not Golf or Tiger Woods, he's usually not all that interested. So, I made this especially for him and deemed it the Knotty 'Man Cave' Pillow for his relaxation space! Now, in addition to completed that one big project, I completed this little bitty project right afterwards. 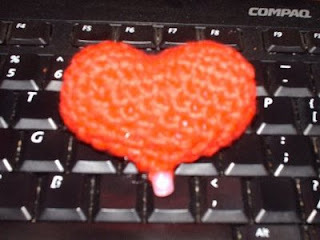 This is the 3-D Crochet Heart. Folks, let me just tell you. This is one of the EASIEST patterns I've ever seen and so super cute you just want to pinch it. I made mine with some leftover Hobby Lobby I Love This Cotton yarn. I added a Pony Bead to the bottom and will string in the chain to the top at a later time because I'm going to make a keychain out of it. I want to make more of these and make them into a little door knob hanger thing like this person did. I'll have to make a run for some SS Brites yarn. So check it out y'all and make one for yourself! It only took about 20-30 minutes. Would have taken less but again, I'm a little challenged on the concentration side. So until next time, I hope everyone's having a fantastic week! ...Here comes Peter Cottontail. Hoppin' down the bunny trail. Hippity Hoppity Easter's on its way. 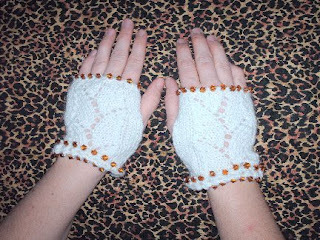 Pattern: Lacy Beaded Fingerless Gloves by Candi Jensen on the Knit & Crochet Today Show. Please Excuse the crooked pinkies. I tried to hid the really bad one. Hope everyone had a Happy Thursday!